The stamen is a male reproductive organ of a flower. It produces the pollen. 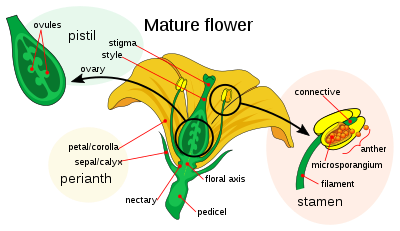 The stamen has two parts: anther and stalk. The stalk is also called a filament. 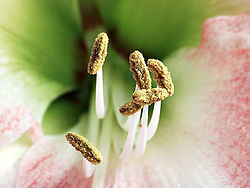 The pollen is released by the opening of the anther. The pollen is carried by some agent (wind, or some animal) to the receptive surface of the stigma of the same or another flower. This process is known as pollination. After successful pollination, the pollen grain (immature microgametophyte) completes its development by growing a pollen tube and the two male gametes move through the pollen tube to the ovule. This page was last changed on 9 October 2018, at 14:08.